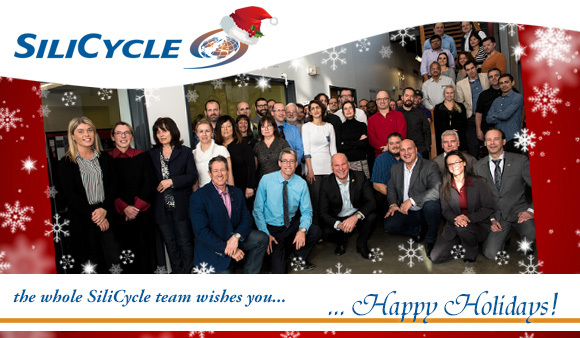 SiliCycle wishes you Happy Holidays! WOW! What a great year for SiliCycle! Thank you for your continued support throughout 2016! We would like to wish you, your family and all of your associates a very healthy, happy and safe holiday season and a prosperous New Year! Not in the picture: Andréanne Goudreau; Andrée Deschamps; Alexis Gourmaud; Aurélie Meng; Christine Ricard, Christophe Mellon; Claude Caron; Claude Thériault; David Chabot; Denis Boudriau; François Arcand; Gary Whipp; Ghyslain Fillion; Jérôme Rasquier; Marcel Plante; Marie-Ève Thériault; Philippe Cantin; Pierre-Gilles Vaillancourt; Vincent Bédard.